Happy Spring Time Beauty Addicts!! Spring time is here, and I love this time of year because of all the beautiful colors! In spring you always here about the latest trend in fashion and bold color dresses and shoes…. but what about the make up?? Well the same rules apply! This spring go wild with color! A lot of women are afraid of color, don’t be! I’m not talking about massive amounts of color Just a pop here and there! 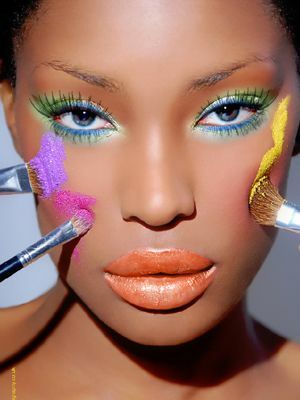 Here are some pictures of the latest make up trends for spring! I decided to create a great spring look as well! I was inspired by the latest ad by Maybelline for they new Color Tattoo eye shadows. Here is the ad and then My take on it! And of course beauty addicts I had to make a video! Hope you enjoy! and if you duplicate it please post a picture here on on my Facebook! I would love to see your interpretation!